The School of Medicine presented white coats to 20 physician assistant students during the annual White Coat Ceremony on April 14. 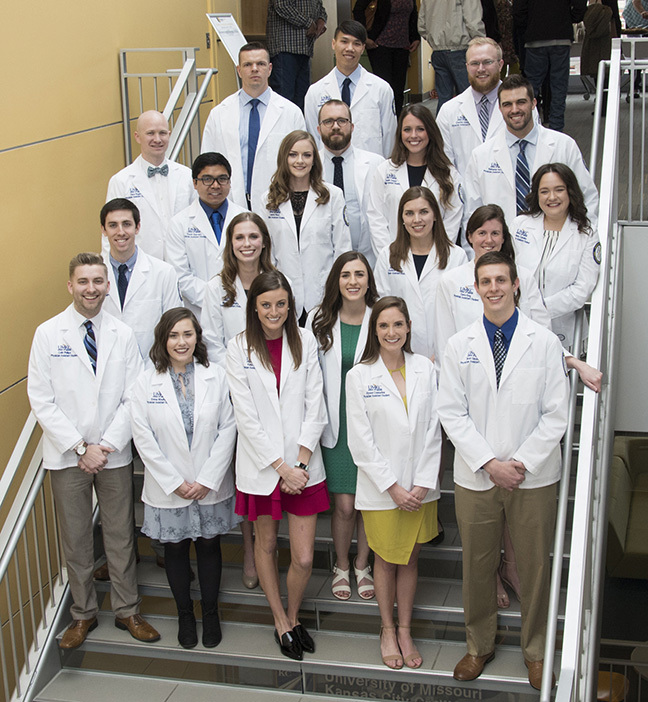 As they prepare to begin the next stage of training, 20 physician assistant students at the UMKC School of Medicine participated in the program’s fourth White Coat Ceremony on April 14. It took place at the UMKC Student Union. Students receive their white coats as they begin their fifth semester of the seven-semester program. The ceremony signifies their transition from the classroom to the clinical phase of training. Beverly Graves, M.D., clinical assistant professor, who served as the program’s first medical director, and Kathie Ervie, M.P.A.S., P.A.-C., program director, led the presentation of the white coats. The day before the White Coat ceremony, students from all three years of PA program heard remarks from Gail Curtis, president of the American Academy of Physician Assistants. Curtis visited the School of Medicine while in Kansas City to take part in a Kansas Academy of Physician Assistants meeting. She told the UMKC students that this is a good time to be joining the physician assistant profession. This year marks the 50th anniversary of the physician assistant profession. It is ranked third on the U.S. News and World Report’s list of 2018 Best Jobs. 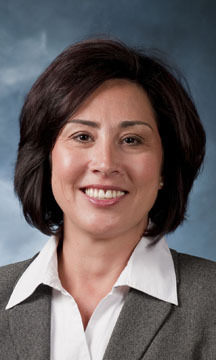 She also applauded the UMKC program that welcomed its inaugural class in January of 2014. 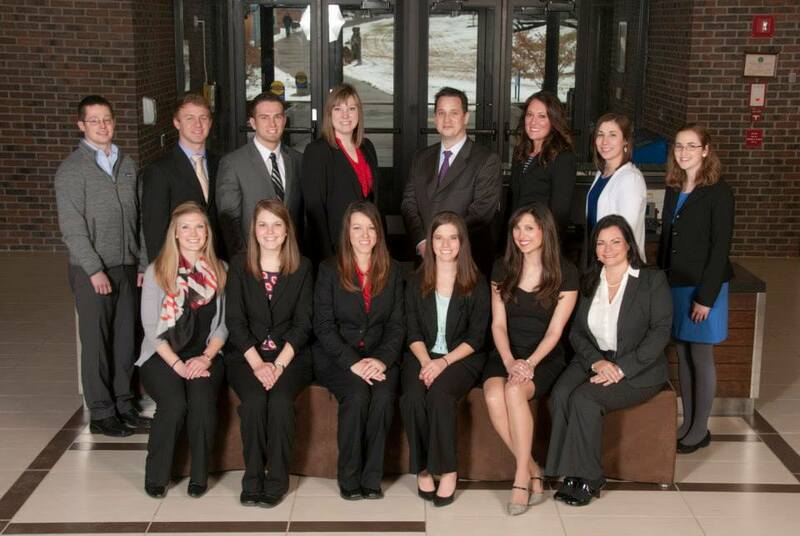 The School of Medicine currently has about 60 students enrolled in the physician assistant program. 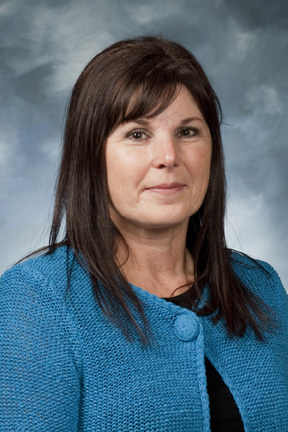 Its first two graduating classes have produced 34 physician assistants. Students in the MMS-Physician Assistant program read the P.A. 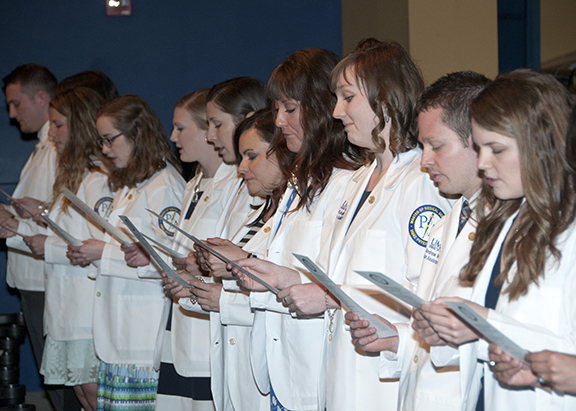 Professional Oath during the program’s first White Coat Ceremony on April 11. Fourteen physician assistant students who are preparing to begin their clinical rotations participated in the School of Medicine’s first Master of Medical Science-Physician Assistant White Coat Ceremony on April 11 at the UMKC Student Union Theater. The ceremony takes place at the beginning of the students’ fifth semester of the seven-semester program to signify their transition from the classroom to the clinical phase of training. After hearing welcoming and encouraging remarks from Kathie Ervie, M.P.A.S., P.A.-C., program director, Beverly Graves, M.D., program medical director, and Irv Stickney, P.A.-C., a member of the advisory board, students recited the Physician Assistant Professional Oath as a pledge to the health and safety of their patients and to maintain a professional code of ethics. The white coat is a mantle of the medical profession, and the White Coat Ceremony occurs with students having the coat placed on their shoulders by individuals who believe in their ability to contribute to the traditions of the medical profession. The ceremony emphasizes the importance of compassionate care and expertise in the science of medicine. The Arnold P. Gold Foundation initiated the White Coat Ceremony to welcome students into the medical profession and set expectations for their role as health care providers by having them read their professional oath. Today, 97 percent of the AAMC-accredited medical schools in the United States and Canada, and osteopathic schools of medicine conduct a White Coat Ceremony. The Foundation partnered with the Physician Assistant Education Association to provide funding to establish White Coat Ceremonies for PA programs at the end of 2013. The School of Medicine first began a White Coat Ceremony for students entering the B.A./M.D. program. In 2003, the School transitioned the ceremony to a program for Year 3 students as they advanced to Hospital Hill and joined their Years 3-6 docent units for the beginning of their clinical rotations. Ervie said the White Coat Ceremony for PA students was modeled after the school’s ceremony for medical students. Students beginning their clinical rotations in the School of Medicine’s Master of Medical Science-Physician Assistant program next April will be greeted with a White Coat Ceremony thanks to a grant from the Arnold P. Gold Foundation. The white coat is a mantle of the medical profession and the White Coat Ceremony takes place with students having the coat placed on their shoulders by individuals who believe in their ability to contribute to the traditions of the medical profession. The Gold Foundation first initiated the White Coat Ceremony for medical students. Today, 96 percent of the AAMC-accredited medical schools in the United States conduct a White Coat Ceremony. The Foundation partnered with the Physician Assistant Education Association to provide funding to establish White Coat Ceremonies for PA progams last December. The School of Medicine first initiated its White Coat Ceremony for incoming students entering the B.A./M.D. program. In 2003, the School made the White Coat Ceremony a program for Year 3 students as they transitioned to Hospital Hill and joined their Years 3-6 docent units for the beginning of their clinical rotations. This year’s White Coat Ceremony for B.A./M.D. students will be Aug. 16 at the Swinney Recreation Center on the Volker Campus. 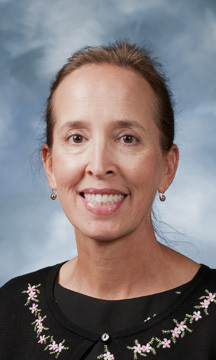 Kathie Ervie, M.P.A.S., P.A.-C., program director, said the White Coat Ceremony for PA students will be modeled after the School’s ceremony for medical students. The ceremony will take place at the beginning of their fifth semester of the seven-semester program to signify the students’ transition from the classroom to the clinical phase of their training. As part of the ceremony, students will recite the PA Professional Oath as a pledge to the health and safety of their patients and to maintain a professional code of ethics.